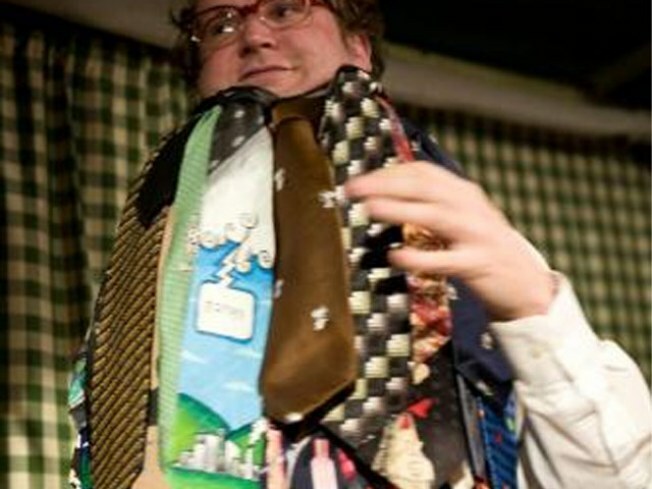 Most Neckties Worn at Once at the World Record Appreciation Society. SUPERLATIVE: The always entertaining scamps behind the World Record Appreciation Society bring together hopefuls for a handful of new record attempts live! onstage! at Joe’s Pub. Past categories have included “Fastest Reenaction Of ‘The Shining’'s I'm Gonna Bash Your Brains In Scene” and “Most Pepperidge Farms Goldfish Chicken-Pecked Off A Table In One Minute.” Tonight’s athletes include Owen Biddle (of the band, The Roots), Craig Baldo (Conan, Comedy Central) and Baratunde Thurston (The Onion), and as usual, profits from the night will be donated to charity (in this case, the Boys and GirlsHigh School in Bed-Stuy, Brooklyn.) 9:30PM. HOW SWEDE IT IS: Dreamy, synthy, unabashedly-’80s pop is the Mary Onettes’ stock in trade, and we only wish there was a new John Hughes movie around so we could soundtrack it with the songs from the band’s album “Islands”. There isn’t, so we’ll have to settle for imagining the montage sequences set to their New Order-y sound, which will be fully on display at Mercury Lounge at 10:30PM. TALENT: The documentary “Mingus” shows the jazz icon at a vulnerable time and turning point in his career and life: On the cusp of eviction from the loft he meant to turn into a school, swilling wine with his young daughter and sharing his opinions about everything from America to shotguns. The New York Public Library’s 16mm film print screens at 92Y at 6:30PM.